The convergence of poetry and visual art begins with a meeting of minds. 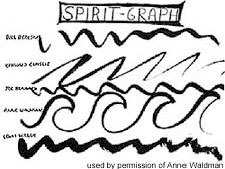 Consider Anne Waldman: her exploratory poetic projects reinvent, rearticulate, refathom, redraw, and reconstruct as a means of interpreting the world around her. Collaboration with artists is yet another means to find, as Waldman writes, “a kind of go-between between states of mind hidden (heart, body) and states of mind realized/enacted as well as what’s overheard” (Vow, 269; emphasis in original). Looking at visual art provides an interesting challenge for exploratory, oppositional, Kali Yuga, anti-genre poets. Finding forms in the world that illuminate the complex states of our human reality, the poet’s words explode off the page into new forms. Q: How can we now navigate a new chaos of possibility? AW: Study “how art stretches the boundaries of logic” (Vow, 128). Q: Or: Stretch boundaries of logic and navigate chaos! Waldman’s collaborations manifest concepts of multilayered intelligence in a different way than her textual work where the palimpsest of lateral thinking reveals itself between genres and shifting modes of articulation. Her work with visual artists reveals less what she knows in a practical sense and gets more to the thinking behind the creative process. In Waldman’s work, no matter how many multiple worlds are engaged, she actually manages to live, to be local, in each one. The only exception to the work she does with artists is that the lived space is more explicitly a shared one. One way to stretch logic: imagine a space, and then fill it. Waldman writes: “To conjure a particular knowledge you visualize an architectural structure and then you walk around and see the details that then bring back the words or the poetry or the line of thought” (Vow, 286). This concept of the architectural imagination is useful for discussing how an artist and a poet get together and collaborate. Visual art — an Yves Klein azure abstract canvas or an intricate Jess collage — enable writers to imagine a space. Once the writer can see something in the artwork reflected back into her own mind, the collaboration has begun. This activity of looking through a work of art involves a certain level of self-reflective thinking. Meaning that what you write in relation to a work of art is going to be different from anything you have written before. There is a story from the Bhagavata Purana about a little boy named Krsna who had a mind of his own. He herds the animals at the wrong time of day; he laughs when people are angry and shouting at each other. He thinks food is sweet only if he steals it, and he distributes his food to the monkeys. One day, the other children tattle on him: they tell his mother Ysoda that Krsna has eaten dirt. Krsna denies it, and opens his mouth to prove his innocence. However, it is not Krsna who is opening his mouth, but a god, Hari, who has taken the form of the child. When Ysoda looks into his mouth, she sees everything: the regions of the sky, the earth with its mountains, islands, and oceans, the wind, the lightning, the moon and stars, the zodiac, and space itself. She sees the vacillating senses, the mind, the elements, and the three strands of matter. Seeing all this, she begins to question herself. She wonders, is this a delusion of my own perception? She sees that her entire world is constructed with false beliefs. She questions her ego, and she suddenly sees herself as one among a series of cosmic particulars. What she sees, in other words, is herself in the context of all that is simultaneously happening around her — her individual self is contextualized within multiplicity, within something much larger than herself. Of course, the Bhagavata Purana is a sacred text, and so the image gyrating in the boy’s mouth was a divine gift — but as Blake evidenced, there is a fine line between divinity and imagination. The mother Ysoda, a poet in her own right, looked into a space and then filled it with the vastness of her mind. In doing this she altered the boundaries of herself in relation to the world. AW: “I write to make up a world, it’s true. I live inside that ‘world’ or universe. You’re welcome to come in as well” (Vow, 131). Q: But how can I see into your world and make sense of it? AW: “The poet’s imaginative eye triggers the synapse creating a complete universe, a bubble of perception which brings the vision of an infinite reality, or construct, together with tangible detail. It’s up to you (human realm) to make the connections” (Vow, 171). Artist/writer collaborations — looking into created spaces and seeing a convergence of minds — are quite ambitious. The ideal collaboration between an artist and a writer is one in which each disappears into the synthesis of their respective minds. When put together, these two minds become what William Burroughs calls a “Third Mind” — the “unseen collaborator” that results in the emergence of a new author. As Waldman explains it, “something new, or ‘other’ emerges from the combination that would not have come about with a solo act” (Vow, 326). This kind of collaboration is different from a writer who writes a poem to illustrate an artwork, or an artist who draws a figure to represent the mood of a poem. The Third Mind actually involves the writer and the artist giving up their own particular egos and creating something together that they never would have imagined doing on their own. It happens when the poet and the artist see into each other’s processes and are able to make something happen in their own process that reflects what they see. It is a synthesis that may look disconnected, exploratory, fragmented — or, it may take on a form that is surprisingly synthesized. Given Waldman’s poetics, the way that her relation to lived multiplicity reflects the complexity of the world around her, this level of ambitious collaboration comes naturally. This is the story of a memorial: The artist George Schneeman had conceived of a collaboration he wanted to do with Allen Ginsberg. Schneeman had traced Ginsberg’s photographs, and then wanted him to provide a text for them. Ginsberg had already written explanatory captions for his photographs, so he would in a sense be writing another kind of caption — this time, one that is a trace of a trace. Not a caption that represents the actuality of the photograph, but rather one that manifests the absence of the person that used to be in the photograph. Schneeman did not know at the time he conceived of the project that Ginsberg was dying — his cancer had not yet been diagnosed. 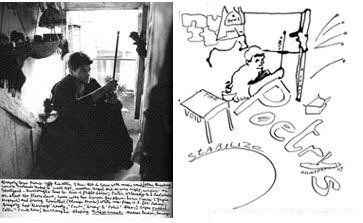 Schneeman proposed that Waldman complete the collaboration with him as an homage to Ginsberg — and the same night that he died, she worked with Schneeman’s drawings. Collaboration in this case was like a ritual, the completion of something pending, the assurance of a full circle — a way of grieving that was about being with the person just lost to the world. In an interview with Lisa Birman about her collaborations with visual artists, Waldman says, “It was consoling to have a place to put the grief which also included the literal traces, as well, of Allen. I stayed up all night sitting in front of George’s tracings, and wrote a few lines at a time. Working with the drawings was like working with the literal traces of Allen” (Vow, 322). Homage is an example of how text and image work together to create a new context. The cover image of Waldman/Schneeman’s Homage is a powerful transference of Ginsberg’s uncle Abe. Schneeman’s drawing with Waldman’s text opens the photograph up to new levels of interpretation and meaning. In the drawing Abe is on his deathbed, reluctantly raising his hand as if an enormous amount of effort was put into this gesture. This same hand which was struggling to be raised in the photograph becomes, “A hand in eternity.” The allusive yet specific quality to the text allows the drawing to be read in a multitude of ways: the hand is waving goodbye as the spirit enters eternity; the hand is guarding eternity; the hand is the hand that has done so much work to shape and create an eternity here on earth. The mendicant Corso looking like a wizard on the verge of using his magic wand to communicate some great message, Ginsberg’s photograph enters into mythic terrain and has many possible narratives. In the drawing, the figure retreats to the background, and what come through are POETRY’s accoutrements: the objects necessary — a bowl, a rod, a staff, a table — to hold up the void. Writing the text, Waldman says that she was thinking both of “Gandhi’s possessions at the time of his death” as well as “Allen’s particular modesty” (Vow, 322). 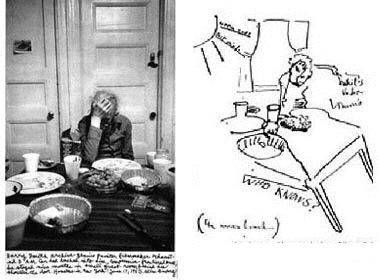 Here is Harry Smith: sad, tired, confused, and in pain — Ginsberg’s caption tells of his story, “homeless in New York.” Surrounded by empty plates and a bowl of grapes. In the drawing Smith is transformed. He becomes “the thinker.” Utilizing “Best Minds” in the text, Waldman is again finding Ginsberg. But she is also seeing Smith, changing him from a despondent old man into an old man burdened by the chaos of the world. What loose fragments are under his thumb? Who knows? But in the drawing is a sign of hope that was missing in the photograph, a sun with words on its rays. The table is filled with many cups. In the photograph they were half empty. In the drawing, they are the accruements of a mind that has absorbed a lifetime of information. The word “Ghost” means that one person has left a place, only to be given presence, interpreted back into life by another person. Collaboration is working with ghosts in this sense — looking at something and reinterpreting it, bringing it into a new life. There is an epigram at the beginning of Kin that gives a direction on how to read it. It tells about early myths in which animals and humans are transferable — the very idea conjures up stories of werewolves and boys who become horses. For this to be the case, as Waldman writes, animals and humans would have to speak the same language. Opening the book, the eye is drawn to Rothenberg’s drawing in the center of the book. Flipping through, the shapes are in the process of transforming. 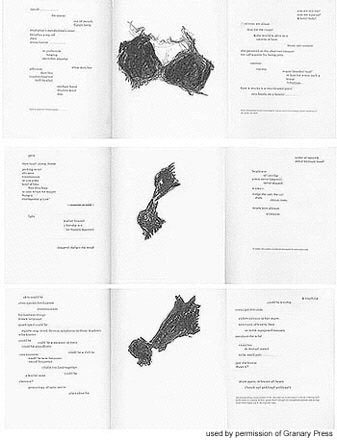 Wavering between the expressionistic, elusive, and abstract to the chatty and informal, the poem is divided between the drawings — physically on the page, and tonally in the language. While the images are in the process of splitting, shifting, and transforming, the text moves along as if propelled by its own internal energy, as if it too were undergoing physical changes. The poem moves in and out of “sense” — it is difficult to follow. Does the confusion of the text reflect the state of becoming another thing? What consciousness is propelling cellular division, nuclear mitosis, globular shape-shifting? If the two parts are speaking to each other as they come together, what logic can they possibly be attempting to utter? The poem is struggling with its own voice — its language is fragmented and what it is referring to is not specific. The text is in a state of flux that mirrors the changing state of the drawings. And as the poems struggle to articulate whatever transformation they are going through, the drawings are undergoing their own process of changing into another shape. Waldman’s Kin is an example of how to write a poem that is not merely illustrating an artwork, but rather is responding to it in a parallel fashion. The language itself is enacting motion; the poems and the artwork have synthesized to become a part of the same creative process. Mental Illustration #3: The book is yet another mind. If collaboration is the synthesis of multiple minds, how can this be manifest as an object? 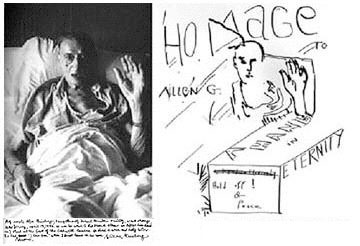 In both Homage to Allen G. and Kin, the form of the book is as important as the work contained within it. In Homage, the pages are loose — like photographs. In Kin, the book, divided in three, embodies triptych consciousness. The book provides the form and shape for the collaboration to be present in the world — it is not merely a container for the collaboration, but is itself parallel to the work. Steve Clay, the publisher of Granary books, is the third and unseen collaborator in this process. He is the man-behind-the-seen who has to imagine the space created by the collaboration before he can set to designing the book. There are many stories about paintings. In Her Story, Murray’s drawings are cellular, mutating, nuclear, nucleus, openings around liquid matter where small intersections of shapes are floating... bodies in the process of being formed, something between animation and machine, between organic and synthetic, between anemone, monster, and human. The act of imagining a space entails that the writer actually go in and interpret what the artist is trying to do — revealing the parts while simultaneously seeing the whole. In Her Story, Waldman looks very closely at what Murray is doing and then finds a form for it in language. 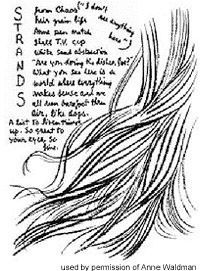 She describes her reading of Murray’s work: “The drawings are coils, bursts of energy, fantastically witty, like cartoons gone awry yet made elegant in their transformation. She seems located in ‘things,’ but what are they?” (Vow, 324) Here Waldman is looking at the artwork in a particular way in order to find a point of intersection where she can find her own form in language. 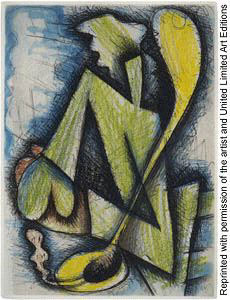 To do this, Waldman inserts a “she” who is finding her form in the floating shapes. This “she” must first disconnect herself from a “he” who is also claiming the territory. Waldman describes the narrative of Her Story as “a narrative logic. It embeds being female, being pregnant, being in a kind of humorous, hormonal situation vis-à-vis the world, the ‘male.’ It’s a contest, a struggle. 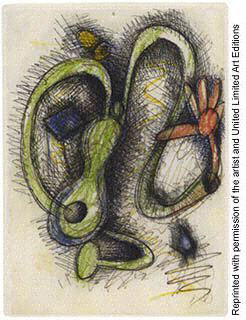 Her drawings suggested a story, not necessarily hers or mine but the story of a state of mind taking shape” (Vow, 325-6). In order to find this evolving mind, Waldman had to actually enter the space of the artwork and find its logic. This is exactly what the “she” is doing in the poem — wandering through a territory where maps have gone awry, navigating a maze of corners and loops, making (marking) her way through. She has wrestled the tubular amoebas and has found her way through the tangle of primal mess — those strings and quarks that keep it all together. Seeing herself in the context of a larger world, Waldman looks into Murray’s drawings and sees an individual body being held together by a larger, unstructured universe. Writing about alternate logics and parallel universes is a particular kind of reading into artist collaborations that neglects one very important element — fun! People coming together with their particular minds to get into each other’s heads. People working to collectively discover shapes and forms that haven’t yet been named. Or have been named, but need a new name. People making poetry and art together, because they like each other’s company and are having fun. People hanging out at dinner parties, beach houses, and front stoops. In the 1960s and 1970s Waldman did several different kinds of collaborations with the artists and writers with whom she was friends. The book No Hassles collects poems, cartoons, stories and photographs that document these activities. The project “Weekend,” for example, was composed in the fall of 1968 with Lewis Warsh, Bill Berkson, Kenward Elmslie and Joe Brainard — all of whom were hanging out for the weekend at Elmslie’s beach house in Long Island. The collaborations Waldman did with the poets and artists of the New York School take on a very different tone from those done later with Murray and Rothenberg. Spontaneous and informal, “Weekend” is an example of a work that is located in a particular place and time. What is emphasized are the everyday activities these creative friends do together, what they think about (their simultaneous profound and silly thoughts) at a particular moment in time. “Weekend” is a portfolio of many different spontaneous line drawings with words floating around them. There is a very private feeling to this collaboration, as if it wasn’t conceived or composed for the outside world to read. This kind of collaboration, between many different people over a period of many years, is a relationship that is formed and sustained by a collaborative spirit that involves being actively committed, engaged, involved in each other’s work. Her Story. 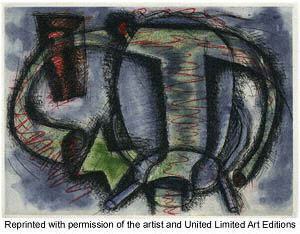 Islet, NY: Universal Limited Art Editions, 1999. No Hassles: An Unhinged Book in Parts. New York: Kulchur Foundation, 1971. Homage to Allen G. New York: Granary Books, 1997. Kin. New York: Granary Books, 1997. Hindu Myths: A Sourcebook Translated from the Sanskrit. New York: Penguin Books, 1975. Waldman, Anne. Vow to Poetry: Essays, Interviews and Manifestos. Minneapolis, MN: Coffee House Press, 2001.